We really wanted to go along with the theme of building something off of classic technology. Nothing gets more classic than a good old game of chess, we decided to take it up a notch and make drunkChess. 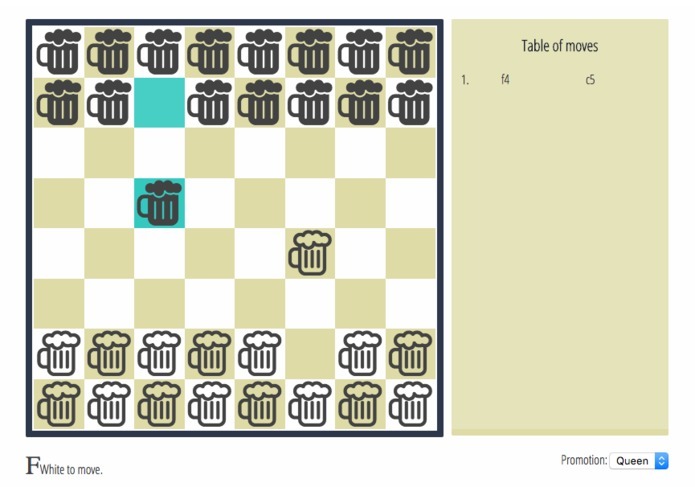 drunkChess is a web app that allows you to play inebriated chess while sober. Challenge friends and test your cognition in this medium to difficult game. We used node, express, socket diode to communicate to different users, react flux to build up an app location, chess.js for move validation and checkmate detection. We went through different requirements such as putting things on the playfield, looking for checkmate, and whether everything was working for players. It was hard integrating everything together, and we still couldn’t host it because it was hard to integrate all the java script technologies together. There was also a lot of debugging which took a long time. Some of us are first time hackers and we are proud of how the final product came out. We learned a bit about programming. We are hoping that we could improve drunkChess to include different levels of play, make it more mobile. Eventually, we would want to make it an available Facebook game.